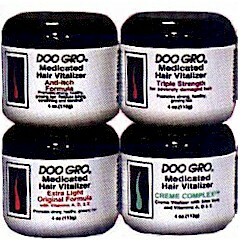 Doo Gro® Medicated Hair Vitalizer Creme Complex™ helps stimulate blood flow to the scalp to help promote strong, healthy, growing hair. "Feather Light" with a unique blend of Aloe Vera, Vitamins A, D & E and many other natural herbal ingredients, Creme Complex™ helps eliminate split ends and stop breakage while leaving hair shiny and manageable. Safe to use on all type of hair, including children's.